Here’s a pretty remarkable photo; the setting is the porch-entrance to the Elysée, France’s presidential palace. It’s a fairly variegated group, at least racially if not sexually. Of course, it’s the victorious French national football team, visiting President Emmanuel Macron and his wife Brigitte. And they’re all singing something. Yes, they’re singing La Marseillaise, France’s national anthem from 1795, and the heyday of France’s revolution. It was relevant back then, with foreign armies streaming into the country to try to extinguish the widespread revolt against the sort of king and aristocracy that prevailed then in the rest of Europe. Or you have the Spanish, luckiest national football players of them all, with a national anthem for which there are officially no lyrics at all! 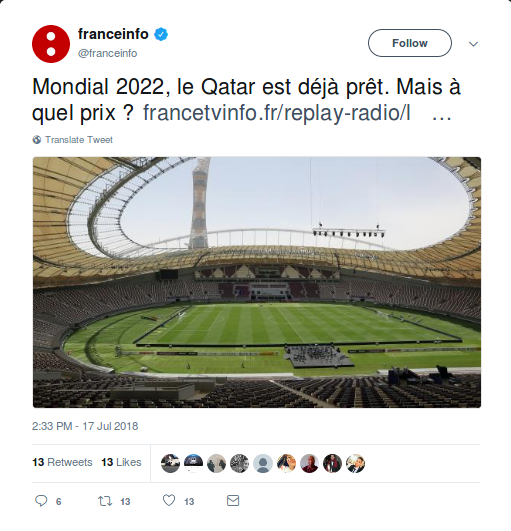 For France, can this be allowed to last? Is that country really still the sort of revolutionary power for which such an official anthem is appropriate, particularly considering its position for decades at the heart of the EU? 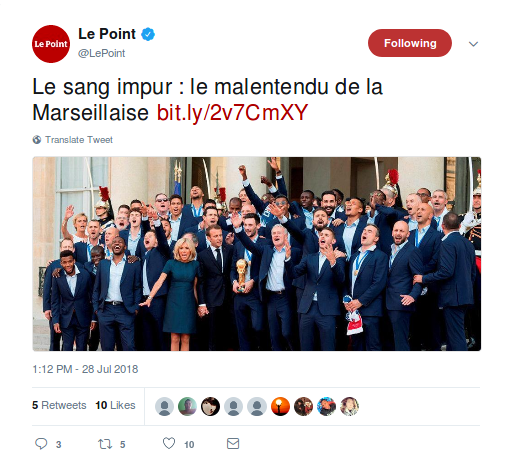 I really would look forward to finding what writer Alain Borer for Le Point has to say about all this, his title even speaks of some sort of “misunderstanding” (malentendu) involved here. But the bulk of this piece is behind their paywall, so I’m not allowed to know. Sorry about that. This is HOT off the press, off the Twitter timeline! (At least for those of you out there reading not long after the date/time of this article’s posting.) And it’s big: it’s a major ruling just out from the European Court of Justice regarding the EU’s internal system of mutual criminal-suspect extradition. If the reader has been paying attention at all to EU affairs (certainly to this Twitter-feed and associated blog), s/he will be aware of the ongoing struggle between the EU and the government of Poland. 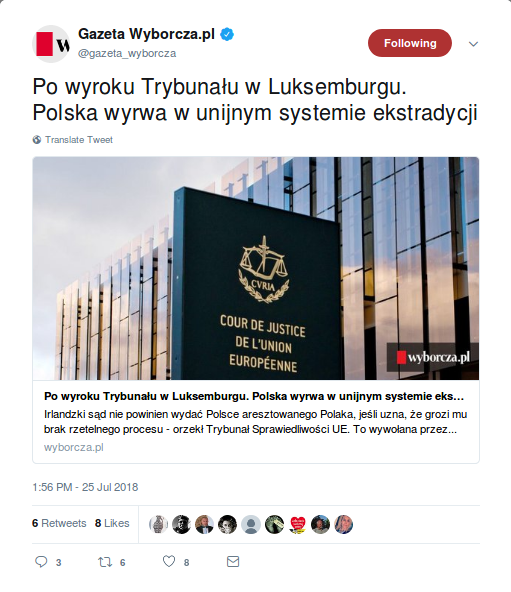 This regards several changes which that particular regime (composed of of one party only, so-called PiS or “Law and Justice”) instituted starting shortly after coming to power in October 2015 elections. Among such authoritarian measures in the eyes of the EU have been those regarding nomination and mandatory retirement of national judges, which subject the courts to much too much influence from government officials. Unfortunately, all that has resulted so far between the EU and Poland is stalemate, with neither side inclined to back down. It’s also true that the EU Commission instituted a so-called “Article 7” procedure against Poland, which could eventually strip that country of its vote in EU matters (except that the Hungarian government has made clear its intention to veto any such development). And the Commission has sued the Polish government at the European Court of Justice, but getting any resolution out of that also takes a long time. Last March, however, a monkey-wrench was thrown into the EU-Poland confrontation from an unexpected source: Ireland High Court Judge Ms. Justice Aileen Donnelly. The Irish authorities had apprehended one Artur Celmer, a Polish citizen wanted back there on suspicion of various drug-trafficking charges, and Judge Donnelly was handed the task of supervising his extradition to Poland in accordance with the EU’s system for that (the “European Arrest Warrant” or EAW). We’re now heading into Europe’s summer doldrums, when everyone seems to be away on vacation, to return only sometime in August. That’s certainly the case for France, which notoriously closes down every year for that entire month. Just enough time, then, to address a remaining philosophical question before packing up the family plus luggage in the car hitting the road. 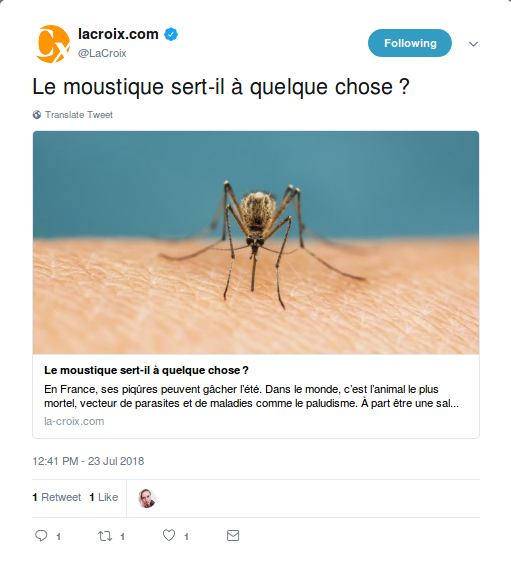 Audrey Dufour of the newspaper La Croix poses a piercing question: Is the mosquito [FR: le moustique] actually good for anything? La Croix [Fr: The Cross] is well-known in France as the national paper of the Roman Catholic Church, so it is rather interesting that Ms. Dufour should take up this particular question. After all, the mosquito has long served as a key piece of evidence for those secular types ready to dispute the doctrine that the World/Universe is so wonderful and intricate that it must have been created by a divine intelligence. An argument that has spanned millenia and currently goes under the labels of “creationism” or “intelligent design,” it is often first attacked by bringing up the lowly mosquito: What sort of world-designer in His right divine mind would have thought to include that? Human-mosquito interactions are inevitably unpleasant for the former across-the-board, whether looking down on a summer’s day to see an irksome insect drawing your blood, to hearing that bothersome whine around your head at night while trying to get to sleep. But that is ultimately small potatoes: what is truly serious about mosquitos is the ~400,000 people they kill each year by transmitting malaria, making them truly the world’s most deadly animal. Right … Anything Good to Say? That’s a pretty heavy weight on the debit side of the ledger. But Ms. Dufour gamely makes a good effort towards trying to find something positive to say. One word: Biodiversity, something Pope Francis has explicitly lauded in his speeches on ecology, and which here expresses the idea that the mosquito, no matter how odious, is an irreplaceable link in the great natural chain of being. And it’s true, fish and amphibians eat mosquito larvae wholesale, while birds and other sorts of animals feast on the grown-up versions. Now, it’s not as if any of these rely solely on mosquitos for their nutrition; indeed, the article points out how it would be hard to prove that any would particularly be affected should mosquitos go extinct entirely. You are currently browsing the EuroSavant weblog archives for July, 2018.